My pocket gun is a 44 special ,stainless Bulldog pug with heavy 240 grain bullets and the house gun is a lever action 44 Rossii with the same 44 loads and it is a 16 inch stainless steel cowboy carbine. I also carry a 38 special...wadcutter loaded, Colt 1911 Clark pin gun. Charter Arms, and is that a factory round or hand loaded? I was a factory...the 240 grain lead semi wadcutter with 7.1 gr of HP38 or WW231 for 925 FPS was real power in the little gun and worked well in the lever-guns too. This is good carry and hunting load without 'magnum' abuse. Bummer, I was hoping for factory. I don't because I'm lazy. I'm trying to reduce the number of calibers I have to inventory. I do really, really want a 10mm/.40 revolver. Talk about bridging the gap between hunting and defense. I think they're not made anymore but I do look in the used listings. No winner yet. I'll also likely get the .44 Charter at some ,point. Carl isn't the first respected gun person I know who loves them. I really like defensive revolvers so it's a good fit. I have a friend who uses and carries Makerov and Tokarev pistols. He just loves Soviet designs and the historical stuff. So there's a 9x18 and a 7.62x25 if memory serves. If you hang out with the historical collectors you'll find other stuff like this. I also carried a Beretta Bobcat in .32 for a while as a backup. While the round is anemic the gun itself is very ergonomic and pointed well for me. Also nice if you want a pistol you can drop in a shirt pocket. But it ultimately couldn't compete with a J frame. I have also,in the past when I could walk, carried a taurus NINE SHOT 357 magnum revolver and it often brought home the meat with it's 6 inch barrel. Haha the local boys. I live about 15 minutes from Coonan... and Magnum Research... and the Federal Ammunition plant. Coonans are great guns if you can find one. It looks like it shouldn't work but it does and the recoil is downright pleasant. On the Coonans for those who own / shot one how much bigger is the grip than a regular 1911? Longer front to back.. I'm not the best gauge as I have large hands but it is a little bigger. Seems to maintain the narrow natural 1911 pointability though. It is a gentle shooter. My father in law uses it because the recoil of a .357 revolver hurts his hands (mild arthritis). Any one out there carry 357 sig? No, I have a buddy who still does. Mild recoil, sharps flash and bang. I used to be a 10mm nerd, still have multiple 10mm handguns, but I carry and shoot 9mm now. I've almost gone the opposite direction. I have three 9mms, an XD9, a M&P Shield 9, and a Derringer 9mm. I have two .38/.357 (a COP .357 and a 5-shot smith Airweight). I'd like to get a Blackhawk .357 with a 9mm cylinder to bridge the gap some day so I'd have one gun to shoot all three calibers. Also been looking at the black hawk .357 / 9mm . Just with they made a boule action like that. I bought a 357/9MM Ruger Blackhawk a long time ago. 9MM surplus was dirt cheap in those days and I rolled a lot of pop cans at 10 yards with it. Unfortunately, the .355" bullets weren't overly accurate as compared with 38 Spl. wadcutters. I ended up having the 9MM cylinder modified to the 357/44 Bobcat Magnum. I was getting over 1800 FPS with 140 grain bullets with it. Loaded with 160 Gr. FMJ silhoutte bullets (Shown in picture), I took it to Alaska with me for my first Bush Pilot contract. After seeing the real size of the varmints (Brown Bears) I switched to a 44 Magnum and 12 GA on all further Alaskan trips. 357 Magnum. - Bobcat Brass - Bobcat Loaded - 44 Magnum. If you don't expect pristine accuracy, the Ruger convertable is a fun gun and will serve you well. For what its worth, when I carry it is a SIG 229 in 357 SIG. You're looking for the Model 610, and it appears they have stopped producing them. That said, I suggest watching the distributors(talo, davidsons, etc.) websites for special models. I missed out on a special run of 3" barreled M29's a few years back. then the 41 Mag,44 special,45 Long colt are good contenders and all are straight wall cases that are easy to reload. I suppose one could go full hipster and go with 9x25 Dillon. 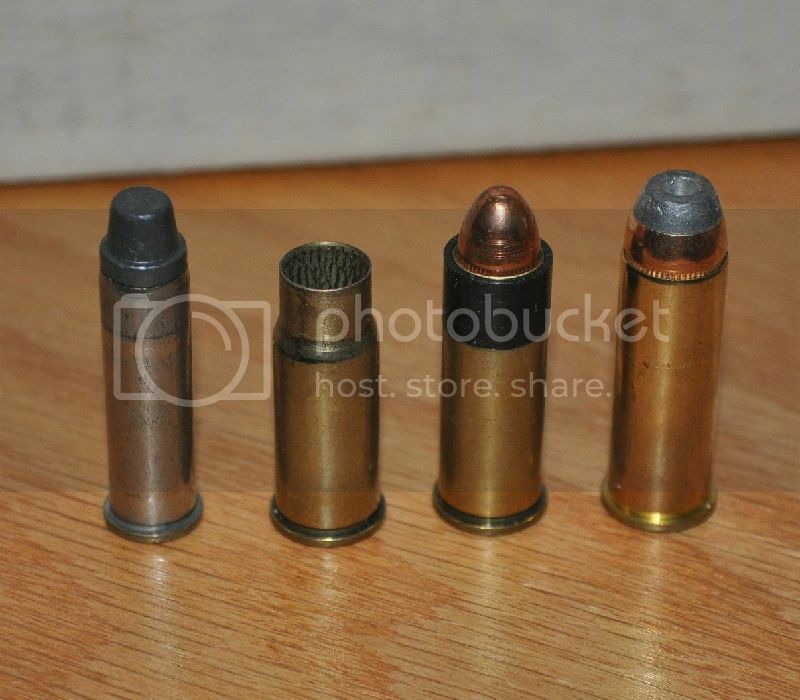 Just as .357 Sig is essentially .40 S&W necked down to 9mm (yeah yeah, calm down handloaders, I know you cant just neck down .40 S&W brass), 9x25 Dillon is 10mm auto necked down to 9mm. 9x23 and 9x25 Dillon are some great "forgotten cartridges" and I would like to see them make a come back.